We spent the morning finishing the small maintenance tasks on Waiouru. 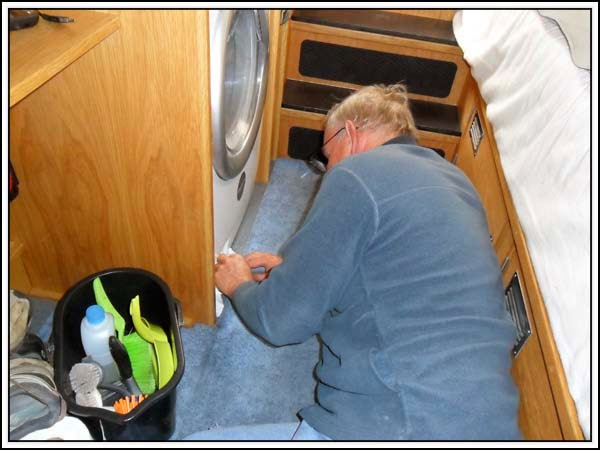 I managed to complete the touch-up painting on the cabin handrail and then decided to check the filter on the Candy washer/dryer after Jan had finish the last (4th) load of laundry. That’s when I realised I’d probably made an error when locating the Candy in the back cabin. This called lying down on the job! 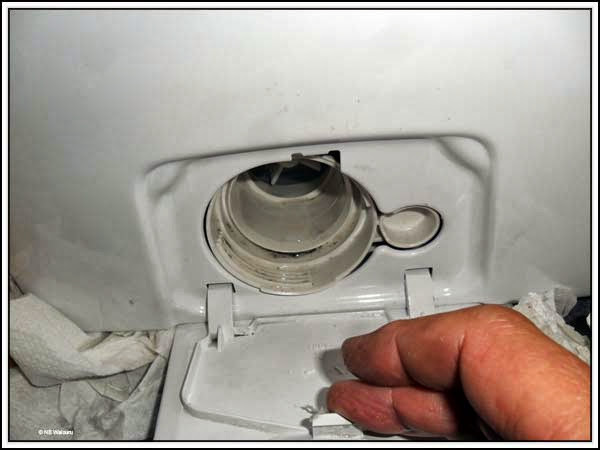 The problem is the filter is located on the front bottom left corner of the washing machine. When you removed the filter plug about 500ml of waste water is released. There is almost no room under the machine to capture the released water. I had to resort to mopping up the water with a sponge and chamois. It’s a problem with the location. The Candy should be about 4-6 inches off the floor which would enable a container to be placed under the filter plug to capture the water. The area underneath the machine could be used for storage. Pity I never realised there would be an issue when it was first fitted. Being on 240V shore power for 40 hours has enabled us to get the domestic battery bank to ‘float’. Each time it reached the ‘float’ stage I would turn the charger off and then back on. The Victron automatically reverts to ‘Bulk’ when it’s turned on which forces a higher current into the batteries. Usually the bulk charge starts at 160-170 amps. But all the charger could initially get the batteries to take was 9 amps. As it’s a 900Ah bank that’s around 1%. So the batteries must be at 100%. 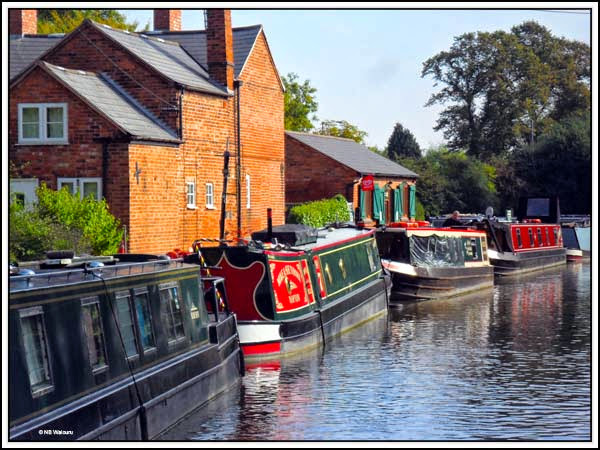 We slipped away from our mooring on the Saltiford Arm at 11.30am leaving Lady Esther to take our place against the wharf. I suspect it’s likely we’ll see Angie & Dave sometime in the next couple of days. It wasn’t a long cruise. Actually just around the corner to the 48 hour moorings below the Cape Top Lock. 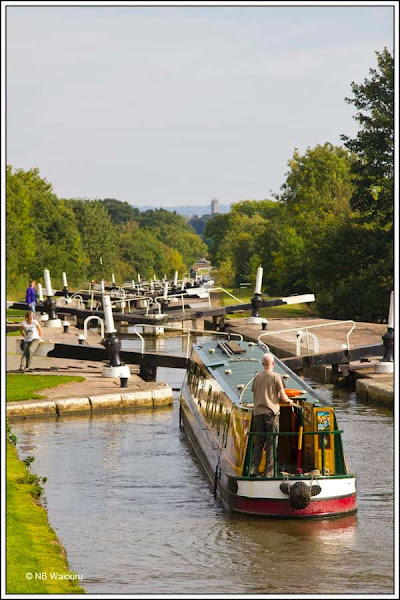 Later in the afternoon I walked back up the Hatton Flight to the top lock for a few photos. 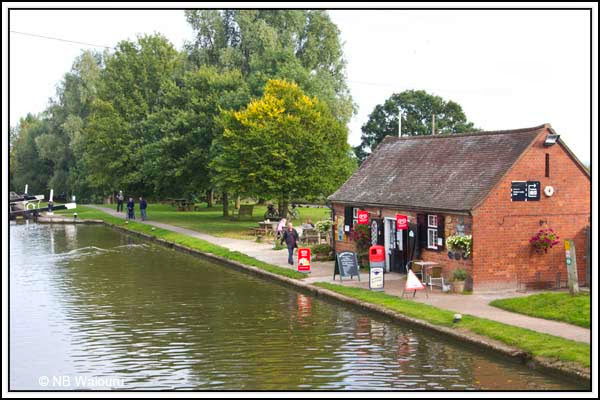 Always makes me smile when I see the cafe at the top lock, why ? Because where the tables & chairs are, under that nice big bit of concrete, is a rather large cess pit ! Used to pump out there (before we were encouraged not to !) & were amused by the looks of horror on the faces of the diners when they realised what we were doing !! Soooo much fun ! !